If the past few years have shown us anything, it’s that there is tremendous opportunity for the biomass industry in Canada, specifically in Atlantic Canada. In thinking of Atlantic Canada, thoughts of our hospitality, friendliness, seafood, and bitterly cold winters might spring to mind. But, with these sweeping winds comes opportunity for growth in biomass-based industries, especially those that have been traditionally under-realized. With sweeping legislation aimed to come into play in July 2018, fulfilling an election promise by Prime Minister Justin Trudeau, Canada will be the first large industrialized nation with a broad system permitting recreational as well as medical use of marijuana. What does that have to do with biomass you ask? It’s a case of not seeing the forest for the trees or in this case, missing the greater opportunity of cannabis by only focusing on recreational marijuana. The real opportunity is about understanding the entire cannabis value chain, from crop science to health research and all the high-value product development opportunities along the way. One region that has taken the lead on defining its own future related to cannabis is the province of New Brunswick. New Brunswick is typically known for its traditional sectors including agriculture, forestry and fisheries. It is often lovingly referred to as the “Fish and Chips” capital of Canada. 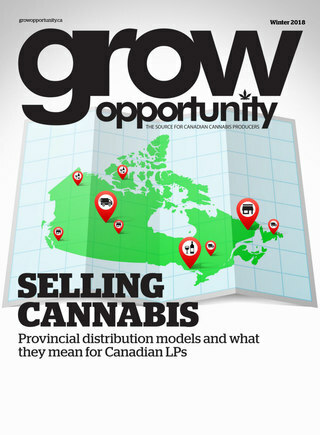 With provincial strengths in smart grid, regional energy generation and distribution, a cluster of water technologies, underutilized and accessible agricultural land (fewer than five per cent in production), and a robust research community that covers the province geographically and spans numerous disciplines, it is not a stretch to see why the province has taken the lead in developing the North American cannabis market. With the premier stating that New Brunswick will build a “best-in-class” hub of infrastructure and research clusters to attract new investment, New Brunswick is receiving strong support from its provincial leaders and has task forces dedicated to supporting the entire value chain. Most notable is the team dedicated to mapping private and provincial land as well as indoor growing facilities. This initiative dovetails into the province’s New Farm Entrants Strategy and the recent broad Cannabis Strategy, which was released in June of 2017. Outlining the value chain with a long-term strategic investment and integrated facilities and organizations plan, New Brunswick is intent on de-risking investments for producer groups and transformational technologies while helping to develop new target markets and ensuring ongoing economic benefit to the province and the region. A strategic R&D focus on cannabis has been established in New Brunswick. At l’Université de Moncton researchers are working on the biology of the cannabis plant. At le Collège communautaire du Nouveau-Brunswick a training program on cannabis cultivation has been established to ensure these new companies have trained employees and provide job opportunities across the province. It will also serve to create innovation in the sector by linking small-scale entrepreneurship to educational programs and building a hub of infrastructure and research clusters to attract investment. N.B.’s Research and Productivity Council (RPC), who has been working in the cannabis field since the late 1990s, is providing testing to more than half of the licensed marijuana producers in Canada. St. Thomas University is home to the first of its kind Health Policy Research Chair on cannabis. Together with almost a dozen licensed hemp and marijuana producers, a broad base of industrial agricultural growers currently evaluating dozens of cultivars for seed, oil and cannabinoid extracts, New Brunswick has become a region of interest to an increasing number of downstream therapeutic technology players who understand the global opportunity cannabis crops will represent. New Brunswick is well poised for new businesses looking to establish themselves or expand to a new market. Atlantic Canada is ranked among the lowest business-cost locations within G8 countries and is home to more post-secondary graduates per capita than the Canadian and U.S. averages, resulting in a highly skilled labour force. As well R&D initiatives are supported through government-funded programs, including competitive regional incentive programs.